L-R: Veronica Hepworth; age-progression composite sketch of Hepworth's last-known serious boyfriend; Hepworth's unidentified boyfriend in 1982. 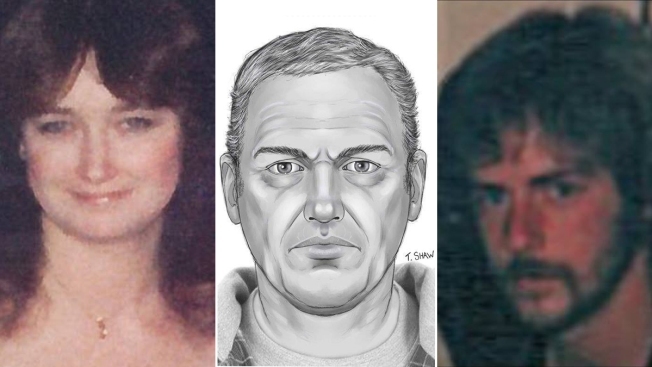 Authorities are hoping a new composite sketch could help them solve the 1982 murder of a 20-year-old Fairfax County woman. Early on Feb. 25, 1982, the body of Veronica Hepworth was found along a driveway along Route 50 in Loudoun County. Hepworth's body was partially clothed. A new age-progression composite sketch shows what Hepworth's last-known serious boyfriend might look like now. Virginia State Police and the Loudoun County Sheriff's Office released the sketch Thursday. The boyfriend, as seen in a 1982 photograph, was white with dark hair. He would likely be in his mid-50s to early 60s now. Hepworth's family and investigators have not been able to identify him. Hepworth was last seen alive at about 1:30 a.m. Feb. 25, 1982 while celebrating a friend's birthday at the Fancy Dancer Bar on Route 1 in Fairfax County. She was found dead about five and a half hours later. Authorities don't know whether Hepworth left the bar alone and tried to hitchhike, or left with another person. However, they received tips that a red pickup truck, possibly a late 1960s or 1970s model, was spotted near the farm where her body was found. Anyone with information about Hepworth or the man in the photograph and sketch is asked to call authorities at 703-376-1690 or 703-737-8487. All calls will be confidential, the Loudoun County Sheriff's Office said.